I’d have said it was Mission: Impossible. The task, should anyone have been foolish enough to accept it: write a children’s picture book in rhyming verse about the five food groups. Combine educational imperatives with an appealing story. Ok, the mission was not without its minor hiccups. Intrepid rhymester Emma Stuart stumbled over occasional rhythm—but that it worked at all seemed almost miraculous. There were a couple of awkward sentence constructions to accommodate the rhyme scheme. And Harry Harvester’s friends were mostly male. But these minor quibbles aside, The Healthy Harvest is admirable in all the right ways. A fresh, zesty look complements a simple storyline. Harry Harvester introduces the reader to the five food groups with the help of his friends—Alfie Apple, Carly Carrot, Charlie Cheese, Wally Wheat, Sammy Salmon and Tommy Takeaway. 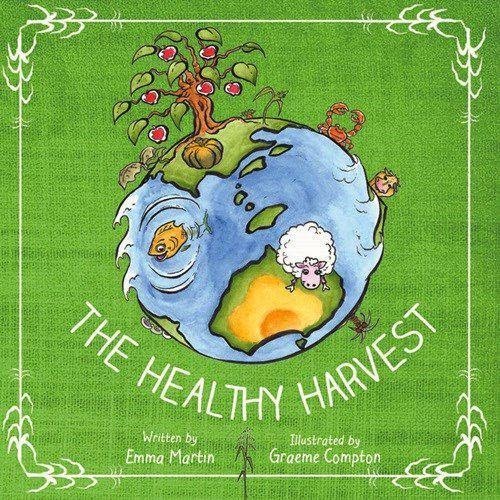 In the course of the story, the reader learns about the five different food groups, food sources, what nutrients are and how they benefit health. Into the five food types we need each day.